This Tula 308 Win ammo is made in Tula, Russia using berdan-primed steel cases instead of brass cases to help drive the cost down since steel is a much cheaper metal than brass. While not reloadable, for shooters who don't reload the savings are quite an attractive upside. If you like to shoot high volumes of ammo to hone your skills without breaking the bank, then Tula is a great option to consider. This ammo features a 150 grain full metal jacket projectile that has steel in its jacket so it will attract a magnet. Tula lists this ammo as having a velocity at 10 meters out as 2,625 feet per second and it is berdan-primed, non-reloadable, and non-corrosive. Bought 4 boxes for some range time with my trusty LR308, seventh round had the primer and rear of shell casing blow out my mag, blow back my bolt and scare the you know what out of me. I have a broken shell stuck inside the barrel now, but am hoping the broken shell extractor tools work as advertised. Gunsmith has yet to inspect rifle, hopefully it's OK.
as accurate @ 25yds to range max 100yds punching out the bullseye. Good Ammo for the Proper WEAPON! Good deal on this stuff, great shipping. Very good ammo at a great price. After I ordered my ammo, I was skeptical about how long it would take to receive it. It showed up less than a week later. I was also worried about quality and performance of steel jackets. These rounds performed way better than expected. I zeroed in my sites at 50m within 15 rounds. After 200 rds not a single misfire. I was firing a Norinco M-14 .308. 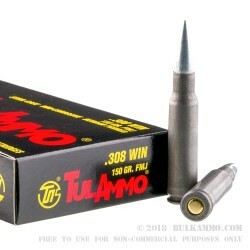 I highly recommend the Tula ammo and I will be back to BulkAmmo.com for more. Q: Will this damage the extractor or the barrel of your gun and how much is too much? A: Over time it can cause some wear. Typically small parts such as extractors have a lifespan of 15 or 20k rounds. They can be picked up for very cheap and replaced fairly easily depending upon the weapon. Steel cased ammo is made from a softer steel than your extractor. You are far more likely to ding up a steel case than damage the extractor. Q: Is the bullet steel jacketed? Thanks. A: Hello Jake! 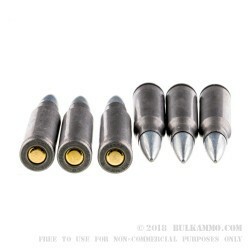 The Tula ammunition is loaded with a bimetal jacketed bullet. This means the bullet jacket contains both copper and steel. Q: Does this ammo come in an ammo can? Thanks! A: Hello Ben, These 150gr. 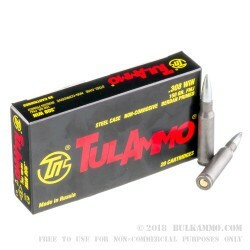 FMJ rounds by Tula in .308 do not come in an ammo can. They come in 25 cardboard boxes of 20 rounds each. 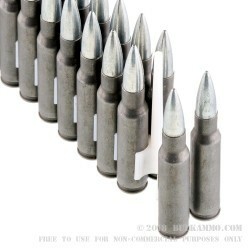 These make great target rounds for your .308 rifle. Q: I have been told that steel casing ammo is difficult to reload. Do you think that these rounds would be 'reloadable' after shooting them, or should I choose rounds with brass casing? A: If you want to reload, you should choose ammo with brass cases. This steel cased ammo will be very difficult to properly reload, and the cases will have a much shorter life. A: That is not a bad idea. Brass and steel cases expand differently, and the steel cases can allow carbon to build up just a tiny bit in the chamber, while brass cases expand to prevent this from occurring. If brass is fired immediately after steel, the carbon can cause difficulty with extraction because the chamber is effectively tighter than it would be otherwise. However, if only steel cased ammo is used, the consistent manner in which steel behaves during firing should not cause any problems with reliability. Cleaning the chamber between brass and steel ammo does not have to be an exhaustive process; a quick brushing should suffice. A: This is non-corrosive ammunition.